As promised, but terribly late, I’m back to share the finished bathroom cabinets with you. The only missing piece at this point is the backsplash, which sort of got abandoned when we had the Great Flood. 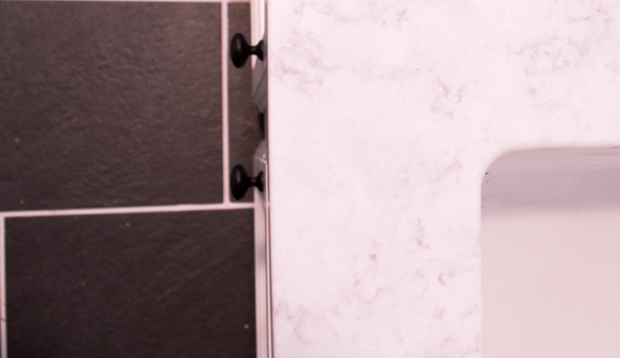 I think upgrading a countertop can make a world of difference in any bathroom renovation. And, it’s probably the easiest upgrade to make. So here is our before picture for reference. Notice the dingy white cabinets, the builder grade counter top and faucet. 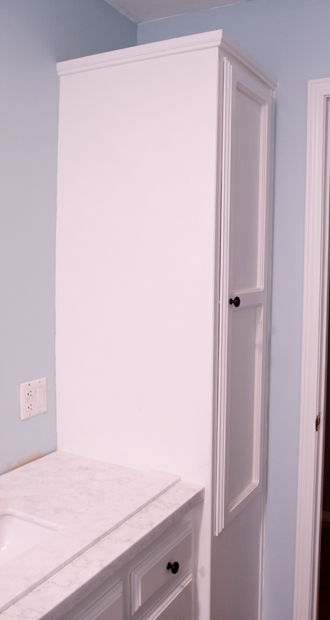 To revitalize the cabinets, I used a Valspar Cabinet paint in Benjamin Moore Simply White. I wanted a stark white to really make the cabinets stand out. 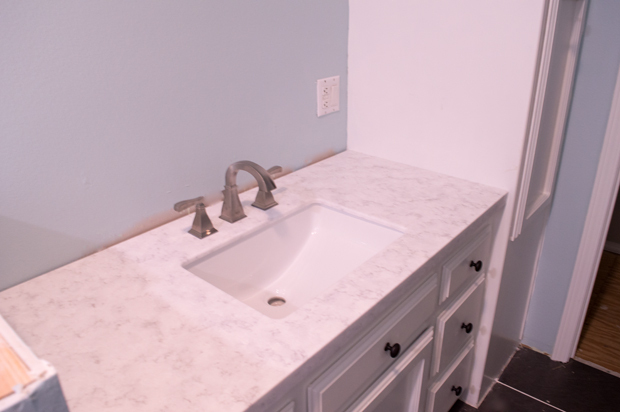 We replaced the counter top with an Evercor Solid Surface countertop called Aspen from US Marble. 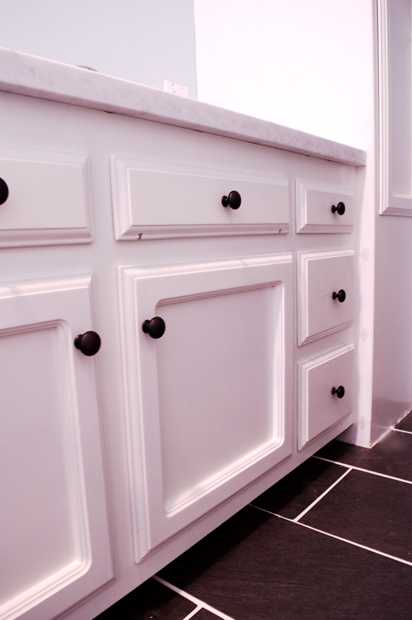 It has the look of a marble top but isn’t as porous; therefore, it won’t stain nearly as bad. I can testify to this, as I had a bit of a clean up this morning with it. We had set some items on top of it during the panic of the Great Flood and when I came back, it had left a stain. I just used an all organic cleaner and it wiped right up. We chose to use nickel faucets for both the sink and the bathtub. It had the matte silver effect that we like but doesn’t show water spots nearly as bad as our previous chrome faucets did. I also changed out the cabinet door nobs. So, I did it, remember when we discussed the mixing of metals in a room? Well I bit the bullet and mixed a darker oil rubbed bronze nob set with our nickel faucets. I think the key to mixing metals is the contrast. I wouldn’t necessarily mix anything that was similar in shade or material. I plan to us a darker oil rubbed-bronze door nob and hinges to finish off the mixed metal look. So, once we get the backsplash on, we are going to install the light and the new mirror I just found. I’m so very thankful the water didn’t damage our new flooring as you can see, it’s still in the pictures above. All in all, I think we got relatively lucky with minimum damage in the bathroom at all.